Get your Slovenian Wine ON. Italian Amaro. Theis bitter-sweet liquid that seems to propagate in every town all over the country, based on what curative and aromatic herbs and spices are available locally. The tradition of Amaro is both practical and romantic- medicinal, and also delicious. Amari are also culturally important- each bottling a perfect aromatic infusion of local agricultural products- very literally the smell of a place. When I was introduced to an Amaro Toscano in Roma by Giampaolo Gravina, I knew it was going to be something special before I tasted it. His is my favorite palate. My bright guiding light in the wide sea of wine and spirits. But I digress. I like the idea of this historical Profumeria producing something like Amaro and Elixir. They are the colognes of the beverage world, afterall. What’s better for your palate (and digestion) after a heavy meal than a light, sweet sip of something delicate and exotic? Of course, this one won’t just soothe you- it will completely seduce you. 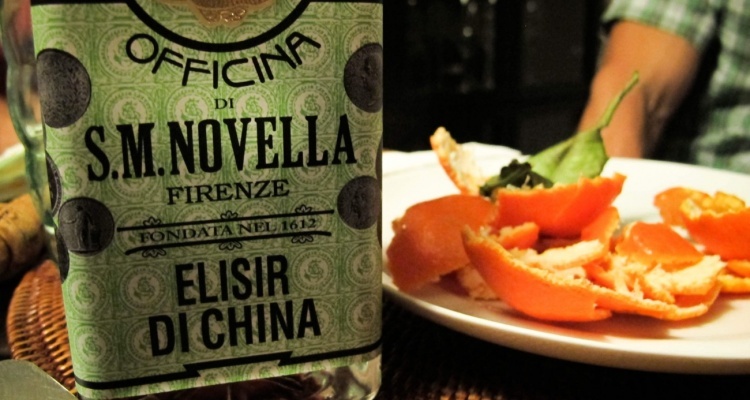 The Elisir di China (pronounced “Kee-Nah”), from Officina Profumeria Santa Maria Novella is one of the most bewitching liquids I have ever encountered. Immediately reminded me of Indian spices and amber and Earl Grey tea- lavender, orange peel, honey, lemon blossoms. Delicate- almost weightless, and laced with that perfect touch of bitterness to counter-act the sweet. The Elisir was the last thing I tasted at Giampaolo’s house that evening and it stayed with my for over an hour. Like a touch of inescapable perfume behind my ear. I was saturated by this digestivo. With all the history the city of Firenze has seen, especially at the Basilica, I am not surprised to find such a strange and exotic flavor here. This is the city of Immigrants, of Mendicants, the city of both the Secular and Religious Elite. History has embraced Firenze with romantic ardor- you can feel the magic when walk these streets. This is a place of Travelers and Artists and Poets… it feels right that S. M. Novella’s aromatic signature would leave an indelible mark on me as well. 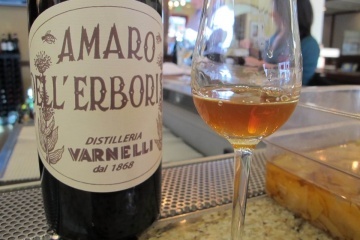 Varnelli’s Amaro dell’Erborista is Music for your Mouth. Stuff sounds amazing! Great write up, Thanks!